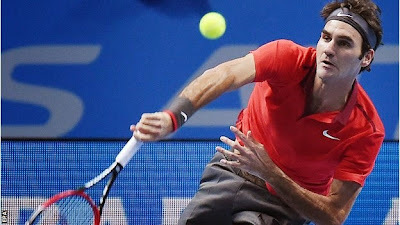 Roger Federer closed in on a place in the semi-finals at the ATP World Tour Finals with victory over Japan's Kei Nishikori. The Swiss won 6-3 6-2 and could qualify for the last four on Tuesday depending on the result of the late match between Andy Murray and Milos Raonic. Federer, 33, needs Raonic to win or Murray to prevail in three sets. If not, the six-time champion will need to secure his progress in his final Group B match against Murray. "I'd like to be qualified [today], to be quite honest," said Federer. "At least then I know I am through rather than having to win a set or maybe having to win the entire match [on Thursday]. I don't even know what it takes. "Usually if you do win in straight sets twice, things look very, very good." Asked about his performance against Nishikori, the world number two added: "He's shown in the past when he gets the upper hand against any player from the baseline, he's very difficult to beat. "Today for some reason he couldn't get it done. Maybe I was playing too well on defence and offence, mixing up my serve good enough. "But I know that Kei can play better. So for me it was really important to take advantage of the fact that I was feeling really good, and then maybe he was struggling a little bit today."